The Center for Global Education (CGE) took us on a long weekend trip to the coast where we visited the towns of Swakopmund and Walvis Bay. The car ride (kombi is the name of the 20 seater van we ride in) there was four hours and it was fascinating to see the scenery change. We left Windhoek passing through lush rolling hills and mountains, we then journeyed through the Otjozondjupa region which had flat grassy plains and tall purple craggy mountains, and finally passed through the flat and sandy Namib Desert before reaching Swakop– a large touristy beach town with very German architecture. 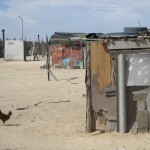 The first day we toured an informal settlement on the outskirts of town and on the edge of the Namib Desert. Swakop attracts many job seekers because of its large tourism industry. The municipality has planned for years to increase infrastructure and formalize the settlement, but as far as I could tell, they had only managed to install street lamps and pre-paid water pumps. Even water is expensive- you must load money onto a small device that can be inserted into the community meter. $10 N only pays for 110 litres. It was truly shocking to see the living conditions of the settlement that houses over 6000 people. The area was completely flat and sandy and small shacks were erected in neat rows as far as the eye could see. We visited a school and a few houses, so we were able to meet and briefly connect with the residents there. The next day was action packed as we traveled to Walvis Bay which is the main port for Namibia. In the morning we met with a representative from the municipality, traveled to the lagoon to see some birds (enormous pelicans), and saw how they extract salt from sea water and process it. After a picnic lunch, we visited a halfway house for abused children. If child protection services picks up a child, they usually stay at the center for awhile before being transferred into foster care, or returned to their families. Strangely, the center is not funded at all by the government and operates completely on donations and the benevolence of others living in Walvis Bay. The director explained that several very young children staying with them were “dumped.” This means they were disposed of in toilets or abandoned in the desert when they were only a few days old. The stories she shared were heartbreaking, but very believable given the fact that abortion is illegal here and unemployment and poverty rates are very high. The center serves a critical function of rescuing and rehabilitating children that truly would not have a future otherwise. My favorite part was our last visit of the day to the Port of Namibia. We learned about the main role of the port- moving imports into landlocked countries such as Botswana, Zambia, Zimbabwe, and the DRC, as well as exporting raw materials and minerals to Europe and South America. 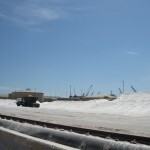 We got to see piles of lead, uranium, salt, and some ingredient for toothpaste, waiting for transfer, as well as UK and US cars waiting to be shipped into the interior. After witnessing so much poverty and stagnation in government policies, Namport was an uplifting and invigorating experience. It was clear that the powerful wheels of the economy were in motion, and it was fascinating to realize that most of what we consume in Namibia must first travel through that port. It really makes you appreciate the effort it takes to make and ship most of the products we use on a daily basis. To cap off our busy day in Walvis Bay, we headed to Dune 7- a 300 foot dune in the Namib, the oldest desert in the world. The climb up was a struggle- the sand was so hot it burned the top of my feet all the way up the extremely vertical dune. Once at the top, the view was amazing and it felt like we ruled the world. Saturday, we had a free day and all 16 of us went on a tour that combined quad biking (ATVing) and sand boarding. We rode deep into the desert on the bikes going up, over, and around the dunes. 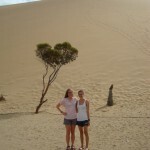 Once we got to some gigantic dunes, we were given waxed boards and we flew down the dunes face first on our stomachs. Quite the adrenaline rush! We ended the day by swimming in the ocean- it was actually warm enough to swim around in for quite some time. Overall, the trip to the coast was one of contrasts: economic activity contrasted with a shanty town in the desert. The thrills of adventure tourism contrasting with the chills felt learning about the lives of abandoned children. Swakop clearly catered to a high end tourist market and it was strange to think that many people passing through are probably oblivious to the other end of the spectrum and the inequalities the region faces. Now we are back in Windhoek for a busy academic week before leaving to travel to the North!